Real talk: we move a lot. If you know me or have read this blog long, you already know this. We have lived in 5 homes in 3 years of marriage, so moving is kind of our thing. You know how Ross's thing is divorce? Well, ours is apparently moving. (If you aren't an avid Friends watcher like myself, please side step that last sentence as it probably made zero sense.) One thing about moving so often is that you can't really buy things to go into a specific house. We have our furniture and decor and try to make it look good in each home we live in, but we always end up doing some re-purposing on different items to make them look better in the next home. We have been working on several little DIY projects that we are excited to unveil soon, but one of the first things we did was repaint my desk. 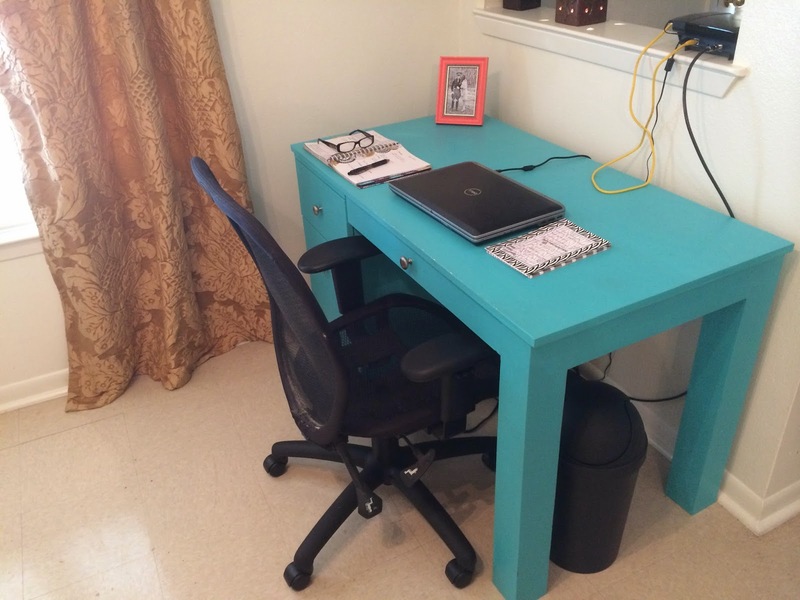 I work from home, so Parker built me a desk last year that I decided to paint turquoise. I loved the pop of color, and it just made working a little more fun. My new office has very light blue walls with white trim. The turquoise desk was just not working in there, and let's be honest, it's always fun to paint and change things up. We decided white would be the perfect color in the new room, and I couldn't be more pleased with the results! My office feels so bright and open with the white desk. This is definitely my favorite office to date! We finished painting late last week, so today is my first official day working at my desk. After bouncing around from the couch to the bed to the kitchen counter, I have to say, I am pretty excited to have a dedicated place to focus on work and a dedicated place where I can leave work once the clock hits 5:00. A lot of people say they would absolutely hate working from home because they would go stir crazy. I get it. I definitely miss the social interaction at the office, but working from home is a huge blessing with this military lifestyle. One of the most difficult parts of working from home to me is feeling like work is separate from home. I am just like the next person- once work is over, I want to focus on my family and take a break from thinking about the office and clients and responsibilities until 8:00 AM rolls around again. Working from the couch doesn't allow for that separation because Parker and I hang out on the couch after work too. The past couple of weeks have been slightly frustrating in that regard, so I am upgrading today. Having a dedicated space in a dedicated office makes a world of difference. I love love love my new work area! We will probably move about 50 more times in our lifetime, so who knows what other colors this desk will end up being. For now though, I am loving the new white! Wow! The white really pops in that room and makes it feel so homey! Good choice! And it's so amazing that the desk will have such a story to tell to your kids and grandchildren down the line! The white looks great!I love how you guys make each house you live in a home. I love the change! paint is always so powerful - and it looks FANTASTIC in white in that space! :) my friends that are military spouses talk about how hard it is finding jobs after each move - so I'm sure working from home is ideal!! We think the desk looks fabulous. Good work Phelps team! White desks are so inspiring to work at, I think! The white desk looks GREAT against those light blue walls! I love how a coat of paint can totally re-purpose something or give it new life! :) He did a good job making the desk! It's amazing what a little paint will do for the life of furniture! We did some ourselves this weekend too. The turquoise was beautiful but I am really loving the white. Looks so clean and bright. He did a great job building it too! More like if you don't get the Friends reference, go watch Friends, haha. I love the white desk! In college I ONLY used my desk for homework so when I wasn't studying I could turn my brain off. I loved the Friends reference, and I might have laughed out loud ;) I loved the turquoise, but the white looks amazing & probably changed up the space in such a huge way with one simple fix! I love working remotely. I don't get to often, but when I do, so peaceful. What kind of work do you do? PS, the white is beautiful! It definitely pops! Very cute! My 'office' has been one side of the dining room table for the past two years.. I'm so excited to move into a house and out of a cramped apartment so I can have a separate work space! So I have a confession. I like to read your blog on those rare times I actually stop to eat lunch. I'm one of those silent stalkers in that I don't ever comment. But when you make a Friends reference, I have to comment. Love you Gran 'Lil! Oh the desk looked nice in turquoise, but I think it looks great in white too! I love that desk! In both colors! I can't wait to set up our office in our new home!